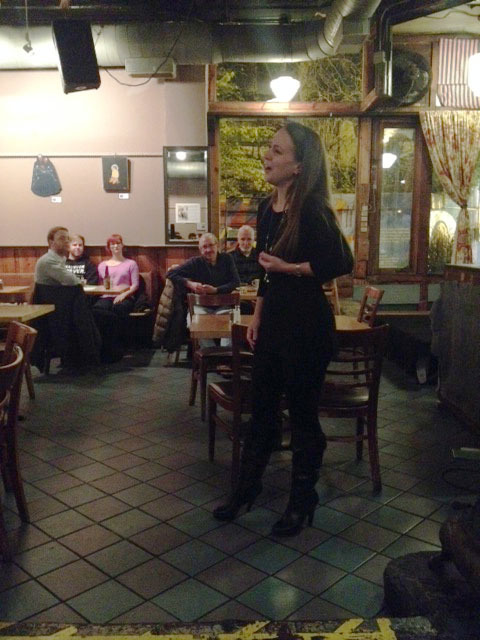 Earlier this month I had the pleasure of attending the first outing of the new incarnation of Chicago’s “Opera on Tap” chapter, “Introducing…Opera on Tap!” at the Heartland Café. Opera singers walked around the tables singing arias that fit the “introduction” theme of the evening, usually entrance arias for a character in an opera, weaving around the solicitous Heartland waitstaff serving food and beverages, singing directly to the audience, and sometimes pulling people from their seats to use as scene partners. Myron Silberstein provided expert piano accompaniment. It was a relaxed, fun atmosphere and very interactive. The evening was divided into sets, and during the intervals one of the singers would circulate with fishbowls, allowing the audience to make donations. It was clear that everyone from the singers to the waiters was having a terrific time. But Chicago’s OOT Chapter hasn’t always had an easy time keeping itself in business. In June 2005, Opera On Tap started out in Freddy’s Bar and Backroom in Brooklyn, founded by singers looking for affordable ways to work on classical music. It has since expanded to sixteen cities, including the latest Chicago revival. Chicago launched its first OOT in 2009, vowing to take opera “out of the concert halls and [put] it into venues where people least expect to hear it.” Voice teacher Val Kuznetsov and one of his students, Erin Thompson, took the reins with board member and pianist Jennifer McCabe serving as accompanist. But it wasn’t long before Thompson and Kuznetsov moved on, and board members McCabe and Diane Schoff stepped into the breach. 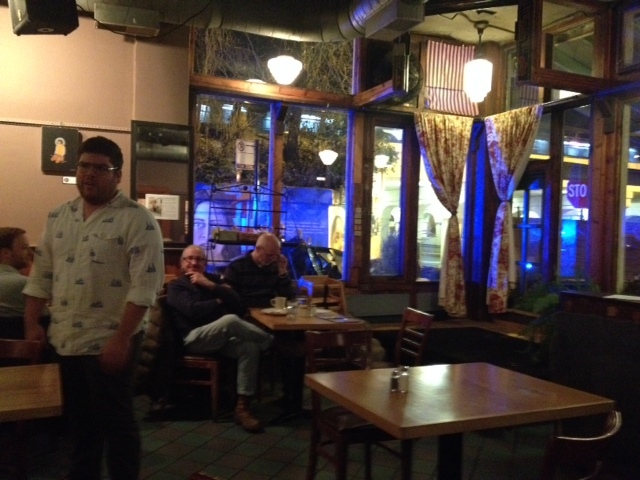 Still, there wasn’t enough people-power to arrange for a once-a-month entertainment in such venues as Trattoria Isabella in Jefferson Park, Uncommon Ground, Angelo’s Taverna on Sedgwick, and Davenport’s. McCabe told me, “I took over for a year or so. It became apparent that whoever was running [OOT] needed time to administer a lot of emails, publicity, board members, grant proposals, rosters, pianists, venues, checking accounts, legal paperwork and more.” McCabe’s other career responsibilities forced her to distance herself from the organization, although she still provided accompaniment when needed, as her schedule allowed. OOT continued to limp along because, not only was it a chance for singers to keep their performing-feet in shape between gigs and have a chance to try out new material with a professional pianist without paying for an expensive coaching session, but they were having a wonderful time as well. Bass David Laub, one of the singers on the original roster, told me, “It was a great way to have fun singing, and stay in shape vocally.” At some point Annie Burton was the Diva-In-Charge, but a move to Ohio caused the torch to be passed to mezzo-soprano Katherine Dalin. “I was left holding the keys,” Dalin says. After a single season, Dalin too had to step down due to other commitments. In the spring of 2013, OOT Chicago went dark. It seems that the lack of solid administrative structure eventually devalued the artistic product, and the money the few customers dropped into the small tips jars often didn’t pay the accompanist a decent fee. The original idea of “theme nights” came and went, and at times, events appeared to be opera Open Mic nights. Regular changes in performance venues couldn’t have helped OOT keep a steady clientele. Lack of sufficient marketing and publicity may have derailed audience-connection, and insufficient auditioning may have caused the roster of singers to thin out. But the last song hadn’t been sung. Tenor Joachim Luis, originally from the San Francisco Bay area, was involved with the SF OOT, and made a move to Chicago. He connected with mezzo-soprano Erin Moll, who had just relocated to Chicago from Ann Arbor, where she was active in the AA OOT. Soon Luis, Moll and bass-baritone Daniel Johanson formed a triumvirate of co-managers, determined to revive the limping organization. Following the mission statement of the parent non-profit, the trio intends to continue to make opera “accessible.” They’ll audition new singers to keep their roster filled on an “as needed basis,” and Silberstein will continue as a part of the team, providing his pianistic expertise along with a rich knowledge of the standard operatic repertoire. While they’ll work together to get the job done, Erin’s nonprofit experience will be put to good use with correspondence and finances, and Daniel’s knowledge of social media will keep the group center stage on the web. Their December offering is titled “Holiday Ham and Cheese.” How can we resist?